The American Kennel club sanctions many dog shows every year. These shows are sponsored by kennel clubs for the participation of all AKC recognized breeds or a specific group of breeds. There is a list of these shows that are either here in Southern California or close to us. 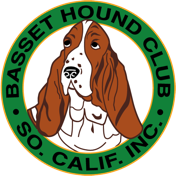 Members and member breeders of the Basset Hound Club of Southern California, Inc. attend many of the shows on this list. Dog shows are a great place for those interested in basset hounds to see excellent examples of the breed and to meet their breeders/owners. These shows provide breeders an opportunity to prove the quality of their breeding stock through the adjudication by licensed AKC judges. If you’d like to know if a specific breeder or owner will be at a show we suggest that you contact that breeder by email. Their contact information can be found under Member Breeders. The following is a list of upcoming all breed shows and hound group shows in Southern California, Nevada and Arizona. The information has been copied for the convenience of our members and guests from the website of Jack Bradshaw, show superintendent. For more information on dog shows check out Dog Shows Explained. Judging at shows is based on the written AKC Standard for each breed. The link at the right will take you to the AKC Standard for Basset Hounds. I highly recommend this page and the links on the page to anyone before going to a dog show. The information will make it easier for them to understand what is happening. A great source for finding AKC Sanctioned shows and show results for the entire United States.